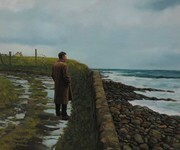 Irish Realist Landscape Artist. Biography, Paintings. The Irish figurative painter and landscape artist Martin Gale was born in Worcester, England, in 1949, but moved to Ireland at a very early age. He learned drawing and fine art painting at the National College of Art and Design in Dublin. In 1975, Martin Gale held his first solo exhibition in the Neptune Gallery in Dublin, since when his artworks have been widely shown in Ireland, England, Europe and the USA. In 1973 he joined the Visual Arts Committee of Project Arts Centre, Dublin followed by the Figurative Image Group in 1979. He represented Ireland in the XI Biennale de Paris in 1980, and in other later events. 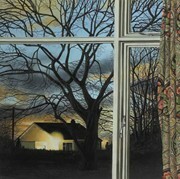 Martin Gale's pictures are represented in many public, corporate and private collections, including: Allied Irish Bank; Arts Council of Ireland; Bank of Ireland; Hugh Lane Municipal Gallery, Dublin; Waterford Municipal Art Gallery; National Self Portrait Collection, University of Limerick; and many others. Gale shows regularly with the Taylor Galleries in Dublin and the Fenton Gallery in Cork. The auction record for a work by Martin Gale was set in 2010, when his landscape painting, entitled Tennis In The Mountains, was sold at James Adams, in Dublin, for €14,500.  For more about classical painters like Martin Gale, see: Irish Art Guide.  For more about academic painting, see: Homepage.